Based on my research into the secret life of sourdough starter, here’s a little info for you on what is actually happening on the inside. 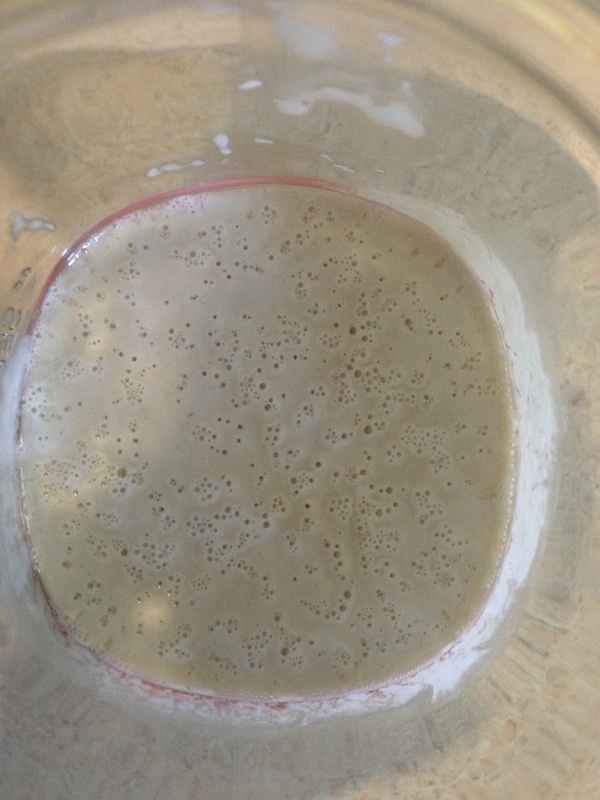 The flour and water mixture creates the perfect environment for certain bacteria and yeasts to live (the good kind). To super simplify and sum it up, the bacteria “eats” the sugars found in the starter (ferments), and the yeast “eats” the product of the fermentation. The bacteria gives the sour flavor, and the yeast leavens the dough. Somewhere out there in the great Internet, I read that stirring the starter frequently could help perk it up if things seem to be going slowly. The thinking was that yeast is not really swimming around the mixture actively seeking out their food. They’re just kind of floating around waiting for something delicious to come by. So, by stirring the starter, you are likely moving the yeast to areas with more food. I figure it’s worth a try, so I added that into my routine. Day 6: (evening) More bubbles on top than in previous days. Trying to give the starter a few extra stirs during the day as I think of it. Fed starter. (morning) Still more bubbles on top that last night. But, still no increase in volume. Fed starter.